As we age, the skin's natural processes of renewal begin to slow and skin loses elasticity. 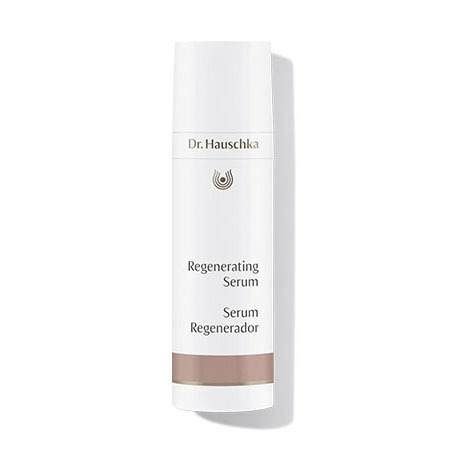 Regenerating Serum supports the skin's natural powers of renewal, helping to maintain firmer skin and minimize the appearance of fine lines and wrinkles. Sensitive mature skin is cooled and calmed. Formulation: Quince seed and kalanchoe extracts replenish, smoothing the appearance of wrinkles while supporting the skin’s ability to balance moisture content. Isoflavone-rich red clover firms and refines, encouraging the skin’s natural processes of renewal, as nutrient-rich clover blossom honey protects. Very easy to apply...light and refreshing. I apply in the evenings and mornings while my face is still slightly damp from cleansing. Sometimes after a spritz of Dr. Hauschka’s toner. Takes very little. It does make my skin feel smoother, pores smaller. It seems to encourage a bit of exfoliation, I think. My skin is more even toned and smooth with this product. No irritation, feels so smooth and refreshing. I started using this product recently and I love it. I have seen improvements on my complexion and I greatly recommend this product! I cannot recommend this product as the alcohol dried and made my skin irritated and tight. Lovely product~ applies easily with lots of slip and is well absorbed into the skin. I have been using this serum for years and you only have to use a small drop for coverage. I use it after cleansing my face at night. Absolutely wonderful for your skin! Regenerating serum has improved the condition of my skin. It is light and smooth when applied. I have a noticed that my skin is softer and more hydrated. I started using this serum when it first came out. Once and awhile I would try another brand, and when my skin didn't feel good, I found myself going back to this serum. stricter standards of what they allow in their products. 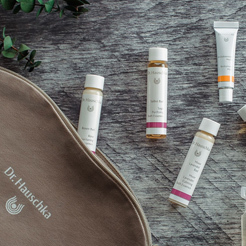 While dealing with hypersensitive skin during 6 months of chemotherapy for breast cancer, Dr Hauschka was the only line of skin care I could use. It's made the most wonderful difference to my skin, and now that I am a survivor of treatment I plan to continue it for the rest of my life. THANK YOU Dr. H for making such lovely products! I actually look better now than I did before treatment, and the nurses are astonished! I love this spray to use several times a year for 28 days. I follow it with products from the regenerating line. My Hauschka esthetician sees a difference in my skin when using it. Not too greasy. I notice a difference in my skin. I will continue using this product. I do have to say I like this product. It's not heavy and really helps with fine lines. I have very dry and sensitive skin and an aversion to fragrances - this product does not bother any of those. I do notice a difference if I stop using it for a while but seeing Everyone thinks I am at least 10 yrs younger I will keep using it! This product might be great for someone with very dry skin but it makes my skin oily and I am 65 years old. Benzyl Benzoate in the serum? Benzyl Benzoate is listed as an ingredient in this serum, but this is a synthetic chemical used as a fragrance, right? I don't 'understand how this line is listed as all natural if there is a synthetic chemical in the essential oil in the serum. Benzyl Benzoate is a naturally occurring aromatic compound in many essential oils such as ylang ylang, cinnamon, rosewood and the Sumatra benzoin tree. The synthetic form of benzyl benzoate is never used in Dr. Hauschka Skin Care. Several naturally occurring essential oil compounds must be separately declared on ingredient labels for those with allergies however, absolutely no synthetic fragrances are ever used in Dr. Hauschka Skin Care. Benzyl benzoate is always a naturally occurring component of the pure essential oils in our products. This worked wonders on my face and balanced my skin out. Delicate fragrance. This serum has been an amazing addition to my skincare routine. I have very dry, sensitive skin and this serum is slightly drying to my face by itself. After cleansing and toning, I mix the serum with rosehip seed oil before applying the Rose Day Cream. I noticed a difference in my skin immediately. Smoother, softer, and smaller looking pores. I had someone had a bunch of sample packets of this serum, so decided to give it a try over a week or so. I tend to get a "vibe" on whether my skin likes something, or it feels healthful and good right away, and this one gave me that sensation...which surprised me. I have fairly problematic skin that reflects my moods and how well I am taking care of myself at any given time, so I was quite pleased, and surprised, to see this regenerating serum has been seeming to smooth to help. I wouldn't have thought to use it, so the samples gave me that opportunity, and I would recommend it as evening out the face. Love it! I use it at night and leaves skin feeling hydrated. I use the serum in AM/PM and can see a reduction in fine lines and my skin is smoother! The Best Product I Have Ever Found! This product is amazing and completely transforms my skin. I have been using all of the other Dr, Hauschka products daily but when I use this at night after cleansing, I wake up the next morning with beautiful skin. It seems to make it more youthful, plump, moisturized and soft. It's hard to explain. Using it daily has made my complexion so much better. It just works magic for me. The Night Serum only dried my skin but this is so different and far better for me! Please never change a thing about this wonderful product! I bought this for my mom and she loved it, said it worked wonders on her skin! I like this serum better for nighttime than the regular night serum. It is much silkier and more moisturizing. Before I was introduced to Dr. Hauschka products I would use a heavy moisturizer at night. However switching to the oil free serum at night has made a huge difference in the appearance of my skin. I highly recommend this product! This serum is a wonderful addition to your hydrating regime. The Regenerating Serum is great for my face especially in the warmer, more humid months. Lightweight but effective, feels clean. I also use the Day Cream, which is best for me in the colder & drier time of year. It is pretty expensive so will have to try to buy it on sale! I applied this at night, after cleansing with Soothing Cleansing Milk. My skin was very inflamed and stinging after running out of my Dr. Hauschka products a while back. My dry, irritated, and flaky skin was noticeably soothed, and supple after just the first night. I've now used it 3 nights in a row as an oil-free night care product, and I'm amazed. My skin still has a way to go, but the Regenerating Serum made a big difference much quicker than I thought it would. Well worth the money; I'll be ordering this again. Thanks for yet another great product! At first when I applied this serum,it imparted a smooth glow. A few minutes later my complexion felt tight and dry. I continued to use it for a week and a half,each time getting the same feeling of tightness and dryness. My sensitive,mature skin didn't react favorably to it. I also tried the Night Serum to see if it was any different and it produced the same results. Since alcohol is the second ingredient listed in both products, it is simply too harsh for me to recommend. This serum glides on efforlessly and soaks right in; no oily or sticky residue; you don’t even know it’s there, but it reallllly works! Another one of my favorite products. Absorbs quickly and noticeable difference. Does it make me look 10 years younger? No. But so far (after a week) I like it and I plan to update this review after using it for a few months. It's doing good things but it does it's work over time., After 3 months, I saw the improvement. The biggest draw back is the cost . This is THE BEST SERUM that I have ever used! I am seeing visible improvements in the skin around my eyes and lips after only a couple months of use just at night! I would readily give this 5 stars, but would prefer that it came in a container that would allow me to see when I’m running low on the product. This is true for the entire Regenerating line, which is also not environmentally friendly in its plastic containers. Please consider packaging it in your metal tubes. Love the way this stuff feels on my skin. I use at night before bed. It really helps reduce the occurrence of breakouts. I have never used a serum before and didn't think it would make a difference in my skin but it did. Price is really expensive so don't know if I will purchase the full size bottle soon but enjoying the travel size while I have it. This serum is silky smooth with a nice light scent. After just two uses, my skin is glowing. Definitely a great purchase. I used at night alone and during the day under regenerating day cream. my skin looks better than it has in a long time, free of breakouts and smaller pores in general. Love it. Ordered it again. The serum help to refresh my skin after using the cleansing milk. I ordered just a sample of this cream which is so wonderful that you offer, so thank you for that. When it arrived however, the smell of this product was so strong I could not leave it on my face. I have a very sensitive sense of smell by nature anyway but wow. I can't for the life of me figure out what in the ingrediants makes it so strong. Do you offer other products that aren't so strong? I ordered the cleansing milk and it is delicious. I have also tried the cleansing cream and it is somewhat strong but beareable for me, but I wouldn't say I love it. Any suggestions would be so welcomed as I am very impressed with your copmpany in regards to clean and being toxin free. Thanks! My skin responds really well to this serum. It feels more smooth and firm when I use it vs when I don’t. I highly recommend! This stuff smells great. A little goes a long way so it lasts for awhile. Not sure yet if its really helping wrinkles . I will give it some more time. I apply Regenerating Serum in the morning and have been pleased with the results. It refines and smooths my skin. However, I cannot use in my nick as I have gotten a rash. I suspect that it might have reacted with my sunscreen. I do not have this problem with the Night Serum. My skin is looking very soft and young. This serum is used more than any other Dr. H product. I finally got comfortable with wearing this at night because I always thought that the skin needed to breathe while sleeping. I have never tried the night serum for an extended period of time. I have been using the serum for about 2 months. The colder weather is especially hard on my sensitive skin that is prone to dryness. It is exceptionally light, moisturizes well, and leaves my skin feeling soft, firm, and supple. Deffinitly can see a difference after first use!!! Ever since i have been using the Serum, people look at me different, then ask what have i done. I look younger. So if think i will continue. Iam very sensitive. This product only makes my skin better. In the morning after cleansing, apply 1-2 pumps to the face, neck and décolleté. Allow serum to be fully absorbed before applying moisturizer. For oil-free night care, apply 2 pumps after cleansing. No moisturizer is needed. Daily care withRegenerating Day Cream, Regenerating Eye Cream, Regenerating Neck and Décolleté Cream and Regenerating Body Cream.